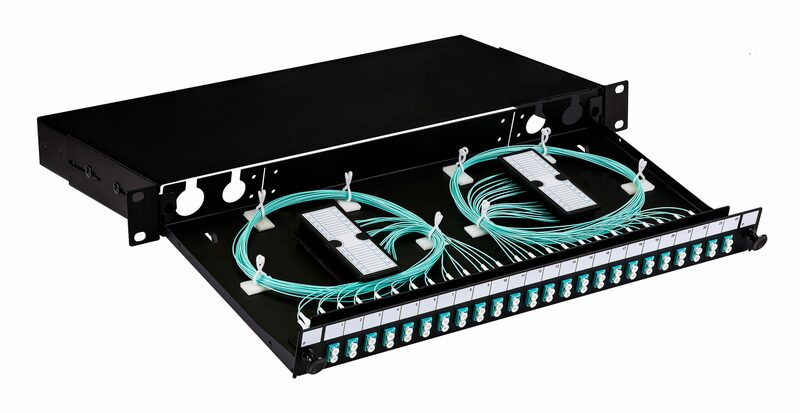 1U 19" sliding pre-loaded patch panel complete with your choice of adaptor and a simple splice management kit, or pre-loaded with pigtails. The tray is locked in place by two, simple to operate plastic latches. When fully extended the tray is designed to lower 45º, or by moving the tray to the side. It will lock to a shallower 10º. This provides the perfect working platform for simple installation and provides easy maintenance and access even after the panel has been installed in the rack.